Yesterday Nottingham played host to the annual Macmillan music festival that took place in many venues, and from what I saw it was enormous. Started up in 2010 Macmillan Fest is a music event that helps raise money for the Macmillan charity and has been going strong ever since. The Rescue Rooms, Rock City, Stealth, Spanky Van Dykes and the Red Rooms played host to 37 bands, both up-coming and mainstream such as Adelphia and Bleed From Within. I pretty much spent most of the day going back and forth from venue to venue seeing the many live bands in action which included a couple whom I’d seen before from previous gigs; a couple of these were Teenage Cancer Casket and Rik Gilbert formerly of Goodnight Astronaut, now Adelphia. Other bands I managed to see during the day were Human Teeth, Anave, The Great White and The Inside is Live at Stealth, all of whom were fantastic. I caught a glimpse of acoustics performers As December Falls and Kaizen and I got to see further acts including Cabin Boy Jumped Ship and Famous for Nothing that have got to be amongst some of the most energetic bands I’ve seen live. Heading over to Spanky Van Dykes venue I saw performances by These Skies and Enormity Falls who were electrifying and bumped into three of the guys from Teenage Cancer Casket along the way. As my time at the event came to an end I went out of my way to see Scottish Rockers Bleed From Within before I left and it was definitely worth it as they were amazing and got the crowd completely hyped. And believe me I could smell not just the sweat but could also sense the adrenalin in the room and feel large amounts of bass. 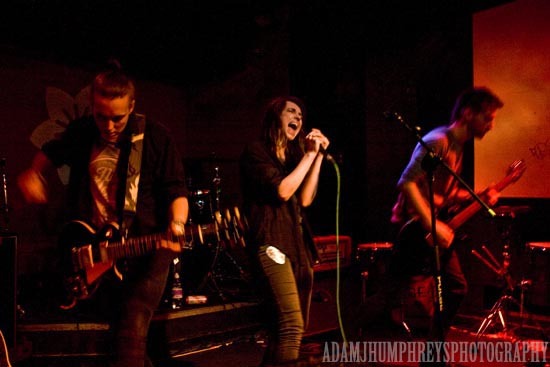 This entry was tagged A City Alike, Adam J Humphreys, Adam's Journal, Adelphia, Anavae, As December Falls, Bleed from Within, Cabin Boy Jumped Ship, Enormity Falls, Famous For Nothing, Human Teeth, Kaizen, Live event, Live music, MacMillan Fest various venues Nottingham 6/9/2014, MacMillan Festival, new music, nottingham, Rescue Rooms, rock city, Spanky Van Dykes, Stealth, The Great White, The Inside is Live, These Skies. Bookmark the permalink.